You have just discovered a veritable treasure of information about all Brethren denominations tracing their history to the original Schwarzenau Brethren; who established themselves in 1708 as a new movement through adult baptism in the Eder River near Schwarzenau, Germany. They were first called Neue Taüfer (new Baptists) to distinguish themselves from older Anabaptists groups such as the Mennonites and Amish. Over the years, differences of interpreting the Bible and practical implementation of beliefs resulted in seven Brethren bodies or denominations: The Brethren Church, Church of the Brethren, Dunkard Brethren Church, Old German Baptist Brethren, Old Order German Baptist Brethren, Fellowship of Grace Brethren Churches, and Conservative Grace Brethren Churches International. 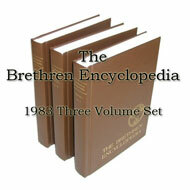 The Brethren Encyclopedia is not only a tremendous resource of information about culture and heritage, these Three Volumes are now a recognized symbol of unity between the various Brethren bodies. You are encouraged to purchase a set for yourself or at least return here often to learn more about Brethren culture, history, beliefs, social issues, and challenges. Historians, Genealogists, and Educators will appreciate its great attention to detail. The Brethren Encyclopedia is a splendid reference companion, enabling one to more deeply understand Brethren practices and beliefs. As one explores and gains more knowledge of the Brethren experience, one may also discern how to recognize and cope with similar achievements and failures in their own personal life. Many historians from the various Brethren bodies have written commendable histories of the Brethren movement but usually focus mostly on their own group. It remained for this cross-denominational effort to succeed in encompassing the vast scope of knowledge to be garnered from each individual Brethren group in one publication. Inspiring voices in the 1970s called upon their fellow Brethren, to commit themselves to a monumental project of capturing the essence of Brethrenism in one work. The Brethren Encyclopedia is the culmination of that energy. With the expressed consent of the Brethren Encyclopedia governing body, Church of the Brethren Network offers this unofficial website to provide a continuous interpretation of that project.